Heights residents are invited to a free Pick-Up-N-Play Rugby session at Cumberland Park, on Nov. 26, 1–3 p.m. This event is a chance for boys, girls and parents to get out and experience flag rugby in a safe, fun environment. Members of the Cleveland State University Rugby team will be on hand to introduce the sport, using a number of fun activities and structured matches. The session is free and open to all. Attendance for the entire two hours is not mandatory—participants should feel free to arrive late or leave early. 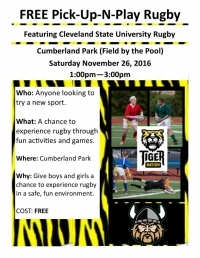 There will also be information on hand about Tiger Nation RFC, the Cleveland Heights youth rugby team that is being formed. More information about the event and the team can be found on Facebook by searching Tiger Nation RFC. Justin Rutledge spent his formative years in Cleveland Heights before moving to Shaker Heights, where he currently lives. He has been involved with rugby for more than ten years, as a player and coach.